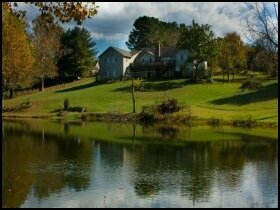 A country home, nestled on a 10-acre estate with beautiful views of the Blue Ridge Mountains and Peaks of Otters. Set in a peaceful setting, where you can enjoy a quiet relaxing stay. Take in the beautiful surroundings by one of our special gardens or relax on the deck and marvel at the beautiful views. The Inn and cottages are suitable for small weddings, romantic getaways, honeymoons, reunions, family gatherings, the business traveler and special luncheons. Accommodations include large suites and cottages with private baths, cable TV, wireless Internet, VCR/DVD, central air, electric fireplace, ceiling fans, refrig., coffee pot and microwave. Come enjoy the breathtaking views of the Blue Ridge Mountains. You have access to the outside fireplace, covered patio, pool and 40′ deck. Come enjoy our dock for fishing or relaxing while watching the sunset over the Peaks of Otter and Blue Ridge Mountains. Be humored by our delightful and playful Nubian goats, chickens and ducks and amazed at the many species of birds and wildlife. Come enjoy southern hospitality at its best. We are located 1 mile off 43N, just outside the Bedford City limits, 8 miles to the Peaks of Otter, Blue Ridge Mountains and minutes to the National D-Day Memorial, Smith Mountain Lake, Poplar Forest, Lexington, Natural Bridge, Lynchburg and Roanoke attractions. The best times to visit Bedford County, Virginia is in the Spring when flowers and birds are everywhere and hiking on the Appalachian Trail is awesome, in the Fall when the leaves change and driving on the Blue Ridge Parkway is breathtaking, in the Summer when you can enjoy the fun of swimming and fishing on Smith Mountain Lake and in the Winter to find out why Bedford is called the Christmas Capital of Virginia. Our nubian goats entertaining the guests, crossing the bridge.